Morante was born in Peru in 1963 as the daughter of a professional jockey and, because of her father's absolute dedication to horses, she held contempt to anything related. This conflict was sufficiently intense to threaten even the state of her father's marriage. However, at the age of 14 her attitude completely reversed and the horse became the center of her life. She attempted to pursue a career as a jockey, but to no avail. 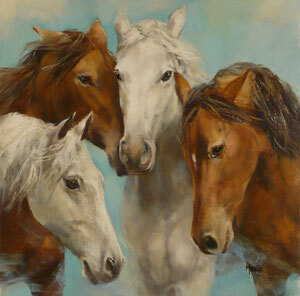 With no clear direction after high school, she met a horse portrait artist with whom she began working and this proved to be the start of an important and long-lasting friendship. After first assisting him in his work, she eventually began contributing directly through the application of underpainting. Realizing Gladys' potential, her new-found mentor advised her to join the School of Arts and she followed his advice, graduating with honors. Morante has participated in numerous exhibitions including several held at prestigious locations such as the Embassy of Spain, the United States Embassy, El Museo de la Nación, Galeria Borkas and the Russian Cultural Institute.